For other uses, see Catnip (disambiguation). Nepeta cataria, commonly known as catnip, catswort, or catmint, is a species of the genus Nepeta in the family Lamiaceae, native to southern and eastern Europe, the Middle East, central Asia, and parts of China. It is also widely naturalized in northern Europe, New Zealand, and North America. The common name catmint can also refer to the genus as a whole. The names catnip and catmint are derived from the intense attraction most cats have towards them. Nepeta cataria is a short-lived herbaceous perennial, growing 50–100 cm (20–39 in) tall and wide. It resembles a typical mint family member in appearance by having the characteristic square stem that members of the Lamiaceae plant family have, but with brown-green foliage. The coarse-toothed leaves are triangular to ovate. The small bilabiate flowers can be white and finely spotted with pale purple or pink. They are showy and fragrant. The plant blooms from late spring through autumn. Nepeta cataria was one of the many species described by Linnaeus in 1753 in his landmark work Species Plantarum. He had previously described it in 1738 as Nepeta floribus interrupte spicatis pedunculatis (meaning "Nepeta with flowers in a stalked, interrupted spike"), before the commencement of Linnaean taxonomy. 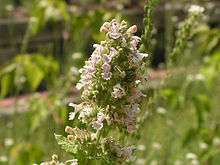 The plant terpenoid nepetalactone is the main chemical constituent of the essential oil of Nepeta cataria. Nepetalactone can be extracted from catnip by steam distillation. Nepeta cataria is cultivated as an ornamental plant for use in gardens. It is also grown for its attractant qualities to house cats and butterflies. Varieties include Nepeta cataria var. citriodora (or N. cataria subsp. 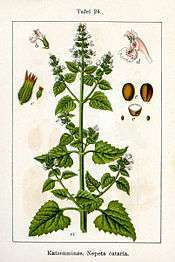 citriodora), or "lemon catnip". The compound iridodial, extracted from catnip oil, has been found to attract lacewings which eat aphids and mites. Nepetalactone is a mosquito and fly repellent. Oil isolated from catnip by steam distillation is a repellent against insects, in particular mosquitoes, cockroaches and termites. Research suggests that, while ten times more effective than DEET, it is not as effective as a repellent when used on the skin when compared with DEET or SS220. Nepeta cataria can be brewed to produce an herbal tea. It is also used as a culinary herb for many dishes. Catnip can also be ingested through smoking the herb. It has only a negligible effect on relaxation, like other herbal cigarettes. Catnip has a history of medicinal use for a variety of ailments. The plant has been consumed as a tea, juice, tincture, infusion or poultice, and has also been smoked. However, its medicinal use has fallen out of favor with the development of more commonplace pharmaceutical drugs. Catnip contains the feline attractant nepetalactone. Nepeta cataria (and some other species within the genus Nepeta) are known for their behavioral effects on the cat family, not only on domestic cats but also other species of cats. Several tests showed that leopards, cougars, servals, and lynxes often reacted strongly to catnip in a manner similar to domestic cats and while lions and tigers can react strongly as well, they do not react as consistently. Cats detect nepetalactone through their olfactory epithelium, not through their vomeronasal organ. At the olfactory epithelium, the nepetalactone binds to one or more olfactory receptors. Not all cats are affected by catnip; roughly 33% are not affected by the plant. The behavior is hereditary. 1 2 "Nepeta cataria information from NPGS/GRIN". ARS-GRIN.gov. Retrieved 7 April 2008. ↑ Wilson, Julia. "Catnip (Nepeta cataria) - Everything You Need to Know About Catnip! | General Cat Articles". www.cat-world.com.au. Retrieved 6 October 2015. ↑ Linnaeus C (1753). "Tomus II". Species Plantarum (in Latin). Stockholm: Laurentii Salvii. p. 570. ↑ Roger Spencer, Rob Cross & Peter Lumley (2007). "Latin names, the binomial system and plant classification". Plant Names: a Guide to Botanical Nomenclature (3rd ed.). CSIRO Publishing. pp. 14–15. ISBN 9780643099456. ↑ "DIY Kitty Crack: ultra-potent catnip extract". Instructables. 3 June 2007. Retrieved 14 February 2009. ↑ "Growing Catnip - Bonnie Plants". Retrieved 2016-08-27. ↑ Agricultural Research. May/Jun2007, vol.55 Issue 5, p7-7. 1p. ↑ Kingsley, Danny (3 September 2001). "Catnip sends mozzies flying". ABC Science Online. Retrieved 14 February 2009. ↑ Junwei J. Zhu, Christopher A. Dunlap, Robert W. Behle, Dennis R. Berkebile, Brian Wienhold. (2010). Repellency of a wax-based catnip-oil formulation against stable flies. Journal of Agricultural and Food Chemistry, 58 (23): 12320–12326 (8 Nov 2010, doi:10.1021/jf102811k). ↑ Schultz, Gretchen; Peterson, Chris; Coats, Joel (25 May 2006). "Natural Insect Repellents: Activity against Mosquitoes and Cockroaches" (PDF). In Rimando, Agnes M.; Duke, Stephen O. Natural Products for Pest Management. ACS Symposium Series. American Chemical Society. ↑ "Termites Repelled by Catnip Oil". Southern Research Station, United States Department of Agriculture – Forest Service. 26 March 2003. 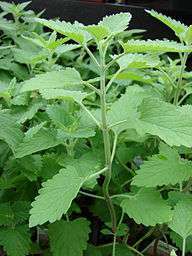 ↑ "Catnip Repels Mosquitoes More Effectively Than DEET". www.sciencedaily.com. Retrieved 2016-07-16. ↑ Chauhan, K.R. ; Klun, Jerome A.; Debboun, Mustapha; Kramer, Matthew (2005). "Feeding Deterrent Effects of Catnip Oil Components Compared with Two Synthetic Amides Against Aedes aegypti". Journal of Medical Entomology. 42 (4): 643–646. doi:10.1603/0022-2585(2005)042[0643:FDEOCO]2.0.CO;2. PMID 16119554. ↑ "Catnip tea". Supplement SOS. Retrieved 22 March 2013. ↑ "How Does Catnip Affect Humans?". RealClearScience. 1 2 3 4 5 6 Grognet J (June 1990). "Catnip: Its uses and effects, past and present". The Canadian Veterinary Journal. 31 (6): 455–456. PMC 1480656 . PMID 17423611. ↑ Chris Poole (2 Aug 2010). Q: Do Tigers Like Catnip?. Big Cat Rescue. Retrieved 2 January 2015. ↑ Chris Poole (19 Mar 2013). Q: Do Tigers Like Catnip? Part 2. Big Cat Rescue. Retrieved 22 March 2015. ↑ Durand, Marcella (4 March 2003). "Heavenly Catnip". CatsPlay.com. Archived from the original on 15 May 2013. Retrieved 2 January 2015. ↑ Becker, Marty; Spadafori, Gina (2006). Why Do Cats Always Land on Their Feet? : 101 of the Most Perplexing Questions Answered About Feline Unfathomables, Medical Mysteries and Befuddling Behaviors. Deerfield Beach, Florida: Health Communications, Incorporated. ISBN 0757305733. ↑ Spadafori, Gina (2006). "Here, Boy!". Universal Press Syndicate. Retrieved 3 May 2014. 1 2 Arden Moore (20 July 2007). The Cat Behavior Answer Book: Solutions to Every Problem You'll Ever Face; Answers to Every Question You'll Ever Ask. Storey. ISBN 978-1-60342-179-9. Retrieved 18 July 2013. ↑ "Catnip (Nepeta cataria) – Everything You Need to Know About Catnip!". Cat-World.com.au. Cat World. 2014. Retrieved 2 January 2015. ↑ Turner, Ramona (29 May 2007). "How does catnip work its magic on cats?". Scientific American. Retrieved 14 February 2009. ↑ Smith, L (2005). "CATNIP". Archived from the original on 20 January 2007. Retrieved 30 March 2012. Khan, M.A. ; Cameron, M.M. ; Loza-Reyes, E. (May 2012). "Interference in foraging behaviour of European and American house dust mites Dermatophagoides pteronyssinus and Dermatophagoides farinae (Acari: Pyroglyphidae) by catmint, Nepeta cataria (Lamiaceae)". Experimental and Applied Acarology. 57 (1): 65–74. doi:10.1007/s10493-012-9532-2. Retrieved 30 April 2015. Wikimedia Commons has media related to Nepeta cataria.